are soon plunged into mix-ups, hang-ups and crossed wires! In The Monkees� pad, everybody appears too busy to answer the phone. A frustrated Michael calls a meeting complaining about their massive dearth of gigs for almost a month because of missed phone calls when they're either at home or out when it rings. So he decides that they should sign up for an answering service, but when Michael calls them up there's no answer. At The Urgent Answering Service (in Room 202), The Monkees approach Mrs. Drehdal for a special cut rate for their services since they can't afford to pay the whole amount until they�re employed. However, Drehdal them a job for a free answering service instead. The Monkees are hesitant until in a fantasy sequence, she as a pseudo-Statue of Liberty gives a moving monologue about the importance of working for The Urgent Answering Service moving them to tears. When she hires them, she warns them not to get involved with the clients. Then Michael gets the first shift and Mrs. Drehdal sends him right to work as she prepares for her vacation in Jamaica. Before she leaves, she tells Michael the red button on the wall is in case he gets tired and sets off. Michael being curious presses the button which triggers a red bed emerging from the wall. When he answers the first call it's from a woman Ellen Farnsby who claims she's planning on committing suicide. Michael becomes very confused and worn-out from attempting to locate Ellen's signal within excessive ringing phones and incoming messages and passes out from exhaustion. Later, David, Micky and Peter, dressed as surgeons, revive Michael with a spritz of seltzer water. After recovering, Michael tells them about Ellen's suicide call and manages to find her address: 4554 Blip Street. He and Micky then set off to find and stop her, leaving David and Peter to be snowed under with excessive ringing phones and incoming messages. David finds a message asking a Mr. Smith to call Zelda Baby; finding that Smith hasn�t called in yet, he delivers the message himself. When he arrives at the Smith's apartment, Mr. Smith, a policeman claims he doesn't know a Zelda but his jealous, skeptical wife begins chasing him around and soon Mr. Smith chases David who in turn chases a half naked woman with a towel around the hall starting a row. Meanwhile, Micky and Mike invade Ellen's apartment and finds it replete with guns, knives, bottles of poison, suicide notes and hangman's nooses! They peruse her address book and find out that Ellen is at the theatre, and are soon on their way. At the theatre, Ellen, who is actually an actress portraying a part in an impending play, is rehearsing the scene she tried with Michael while the director continues to encourage her to live the part. Back at The Urgent Answering Service, Peter receives a call from Manny Spink, a bookie claiming to be a theatrical booking agent, who tells him to give a message to Freddie that he has a booking for The Popsicles, a vocal group on the third and pay $10,000. Then Manny tells Arnold, his runner, of his scheme to use The Urgent Answering Service to hedge gambling bets, pretending the horses are vocal groups and that he is an agent. Meanwhile, Micky and Michael dash over to the theater to look for Ellen; her director tells them that she just departed - for her apartment. Micky decides to relieve Peter at The UAS (where he, upon pressing the red button winds up on the bed that emerges) while Michael heads back to Ellen's apartment. Meanwhile David is still in the middle of a huge chase at the apartment complex that now consists of the Smiths, a track runner, football player, the half naked lady and a gorilla! He's finally able to make his escape and heads back to the Answering Service, wearing a toga and clutching a torch. Michael shows up at Ellen's place where she has a noose around her neck and continues to play the part as a suicidal woman, calling him �Jeffrey!� Michael manages (or so he assumes) to stop her from jumping out a window, stabbing herself, taking pills and hanging herself before receiving a call from David and Micky about Peter's whereabouts. David and Micky continue to search for Peter and stumble upon him when they press the red button and finally discover him now sleeping on the emerging bed. Meanwhile, Michael, believing he's succeeded in pleading with Ellen against the easy way out and convinced her not to do anything until tomorrow, leaves her alone at her apartment. At The Urgent Answering Service, Manny and Arthur threaten David, Micky and Peter with guns; Manny exposing his scheme and accuses one of The Monkees of fouling up his bet by changing it from Popsicle to Pelicans and Peter admits he changed it thinking it was a gig since The Pelicans needed the work. Since it cost Manny $90,000, he demands the money but the guys only scratch up $8.12. Michael enters the fray, unbeknownst to the danger his mates are in, and squeezes through the two hoods in order to answer a ringing phone, but he misses the call. He spots Manny and Arthur and tries to escape with a diversionary tactic, but they aren�t fooled so easily. The crooks are prepared to get rough, when a uniformed Mr. Smith shows up with his wife demanding David to tell his wife that message he gave him wasn't for him. David exposes Manny and Arthur�s scheme to the cop and soon there's a mad chase to song �Look Out (Here Comes Tomorrow)� while the phones continue ringing, which concludes with the crooked gamblers trapped under the receiver of a giant green phone. As Mr. Smith arrests Manny and Arthur, Davy convinces Mrs. Smith that the message was from another Mr. Smith. The guys ask about Ellen and when Michael brags about how came to her rescue, she barges into the place now dressed in a stunning mink stole to thank Michael for helping her rehearse for a play before rushing off leaving Michael a little embarrassed. Peter reminds them of the bright side claiming what would have happened if they had gotten involved with the clients, and his annoyed mates place his hands over his eyes before exiting. �The Monkees On The Line� was the 32nd and final episode of The Monkees to be completed for its first season. It was also the last episode to bear the musical supervising stamp of Don Kirshner, who, after releasing the "A Little Bit Me, A Little Bit You"/"She Hangs Out" (#66-1003, withdrawn!) single against a 50% Monkee-control rule, was bounced from The Monkees' project. �The Monkees On The Line� was also the first episode of the series to be written by Coslough Johnson. This was Johnson's sole Monkees cowriting effort (with Gardner and Caruso); he would later go solo as the author of 5 episodes of The Monkees in its second season: Episode No. 37, "Art For Monkee's Sake", 46, "The Monkees On The Wheel", 49, "The Monkees Watch Their Feet", 51, "The Monkee's Paw", and 55, "The Monkees Mind Their Manor". 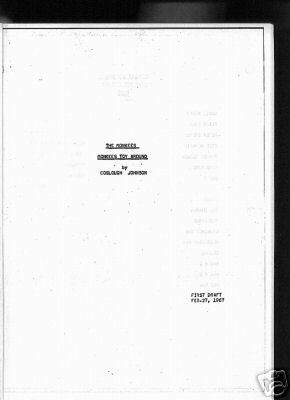 On February 27, 1967, Johnson compleeted the first draft of a sixth teleplay, "Monkees Toy Around." The script was totally rejected by Raybert Productions, and to this day this has been dubbed by scores of Monkees fans/collectors as the "lost" (59th?!) Monkees episode. The end credits inadvertently read �Look Out (Here Comes Tomorrow)� as "Look Out" (Here Comes Tomorrow), with the quotation marks surrounding only the first 2 words of the title. When �The Monkees On The Line� aired on CBS Saturday Afternoon, �Look Out (Here Comes Tomorrow)� was replaced by �Little Girl�, a Micky Dolenz-composed track from The Monkees' 8th album, The Monkees Present Micky, David, Michael. This episode's third and final CBS Saturday airing, September 11, 1971, launched a third and final season of repeats of The Monkees on The Eye Network and occurred 4 years after The Monkees' second season debut in primetime on NBC. An alternate ending of �The Monkees On The Line� finds The Monkees getting a lead on a good job, but finds The UAS didn't take the address! Also, The Urgent Answering Service was originally named The Alert Answering Service. On the day after this episode's first-run airing, The Monkees wrapped up recording sessions for The Monkees' Headquarters. When Michael greets Ellen at her front door, Ellen screams, "Jeffrey!" Bert Schnieder, co-producer of The Monkees TV series, has a son named Jeffrey, whom he had check the scripts of each episode for adolescent jargon. The premise for this episode was Judy Holiday's character the 1960 MGM musical/comedy Bells Are Ringing, which co-starred pre-Monkee guests Dort Clark (�Monkees A La Carte�, "The Picture Frame" [a.k.a. "The Bank Robbery"], "The Monkees On The Wheel") and Milton Parsons (�Monkee See, Monkee Die�). Also notice the second appearance of Michael's light blue wool hat; he would make a third and last appearance with the blue hat onstage at The Coliseum in Episode No. 32, �The Monkees On Tour�. The huge green phone which appeared at the end of the �Look Out (Here Comes Tomorrow)� romp was reused in The Monkees' 1968 Columbia movie HEAD. The phone number on the phone is 555-7231. David is seen wearing the same gold 8-button shirt he wore in Episode No. 7, �The Monkees In A Ghost Town�. He wears it again in the next episode, �The Monkees Get Out More Dirt�. The set of Manny Spink's office seen here was first used in Episode No. 11, �Monkees A La Carte� (where it did double duty as Fuselli [Harvey Lembeck]'s office in Pop's Restaurant and the Inspector [Dort Clark]'s office in Police H.Q. ), No. 12, �I've Got A Little Song Here� (as Bernie Class [Phil Leeds]' office), and No. 19, �Find The Monkees!� (a.k.a. "The Audition") (as The Missing Persons Bureau's office), and it will be used once more in Episode 53, "The Monkees Race Again" (a.k.a. "And Leave The Driving To Us") (as the racing official [Don Kennedy]'s office). This set was used on several other Screen Gems sitcoms, like Darrin Stephens' office on Bewitched (ABC, 1964-72) and Capt. Tony Nelson's office on I Dream Of Jeannie (NBC, 1965-70). The Monkees' run-in with Manny Spink in this episode was their first of 2 encounters with crooked gamblers; the other is Episode No. 46, "The Monkees On The Wheel". The Monkees previously disguised themselves as surgeons in Episode No. 17, �The Case Of The Missing Monkee�, and No. 22, �The Monkees At The Circus�. Micky disguises himself as a doctor in No. 30, �The Monkees In Manhattan� (a.k.a �The Monkees Manhattan Style�). Events in this episode were foreshadowed in Episode No. 2, �Monkee See, Monkee Die�, in the scene where Mme. Roselle (Lea Marmer), Ellie Reynolds (Stacey Maxwell), and The Monkees have a seance in an attempt to contact the spirit of John Cunningham, and they instead get his answering service. The subject of answering services surfaced again in No. 4, �Your Friendly Neighborhood Kidnappers�, where Micky and Michael place a mock phone call to the ficticious Arensky & Genorra, Kidnappers. The teaser of a Spanish-dubbed version of �The Monkees On The Line� has circulated on public-domain VHS among collectors. Micky spritzes Michael with very wet seltzer water, but a second later, when he says "Don't do that! ", his face is dry! All four Monkees were previously seen spritzed with seltzer water at the end of Episode No. 23, �Captain Crocodile�. The late Milton Frome, who plays Manny Spink here (he also portrayed Lawrence Chapman on The Beverly Hillbillies [CBS, 1962-71]), can also be seen as nightclub owner Mr. Latham in Episode No. 57, "The Monkees Blow Their Minds." Frome would soon later appear with pre-Monkee guest star Stuart Nisbet ("The Monkees In Texas") in a May 4, 1967 episode of Bewitched (ABC, 1964-72), "There's Gold In Them Thar Pills," its third season finale. The late Lea Marmer (Mrs. Smith) previously appeared with Henry "Mr. Babbitt" Corden, pre-Monkee guests Joe Perry (�The Monkees In The Ring�) and Vito Scotti (�The Case Of The Missing Monkee�, HEAD) and series developer Paul Mazursky in an April 27, 1962 episode of The Twilight Zone (CBS, 1959-64), "The Gift." The late Susan Browning, seen here as the histrionic thespian Ellen Farnsby, later portrayed Pat Gimble on Mary Hartman, Mary Hartman (Syndicated, 1976-78). (Incidentally, this soap-opera satire also featured Monkee guest actors George Furth [�One Man Shy� (a.k.a. "Peter And The Debutante"), "A Coffin Too Frequent"] and Billy Beck ["The Devil And Peter Tork"] in guest roles; Browning played the role of April in the original 1970-72 production of Stephen Sondheim's musical Company," the book for which was written by George Furth!) Browning later played a Choir Nun in the films Sister Act (Buena Vista, 1992) and its sequel, Sister Act 2: Back In The Habit (Buena Vista, 1993). The late Richard O'Brien (Mr. Smith) played Frank Wilson in two episodes of Wonder Woman (ABC/CBS, 1976-79). Fans of Star Trek (NBC, 1966-69) will recognize Jack Donner (Director) as Subcommander Tal in the September 27, 1968 episode "The Enterprise Incident".